I can’t believe I forgot to show you this awesome project in our last house. I was going through old photos and came across these and had such a doh! moment when I realized I never shared this. So, for those trying to keep up with every place we’ve ever lived, this was our 2nd house in Austin (our country house), before we moved here to Colorado. And to confuse you even more, this was post-renovation on our kitchen in that house. 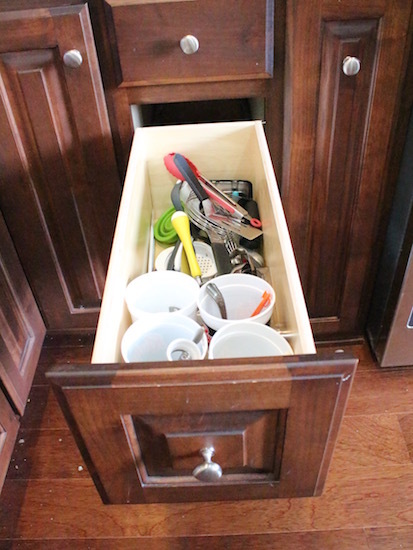 When we designed the kitchen we had the cabinet builder make a couple extra deep narrow drawers for taller stuff. They are awesome and we love them, but they got full and cluttered quickly. 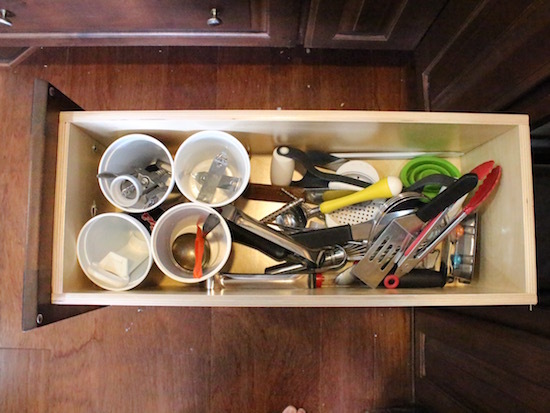 In an attempt to get more organized I threw a few plastic cups in the drawer to hold some of the smaller items, but long-term that was not a great solution. 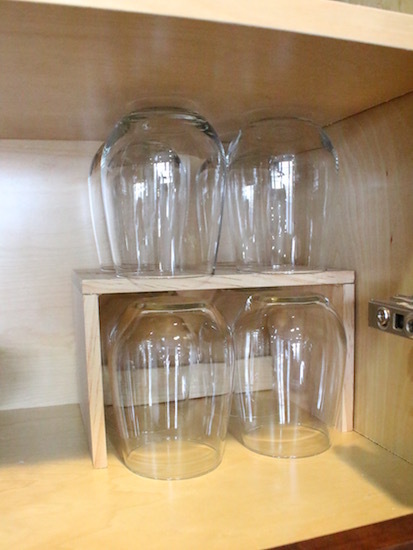 Also, in our cabinet we have some stemless wine glasses that were taking up a lot of space. 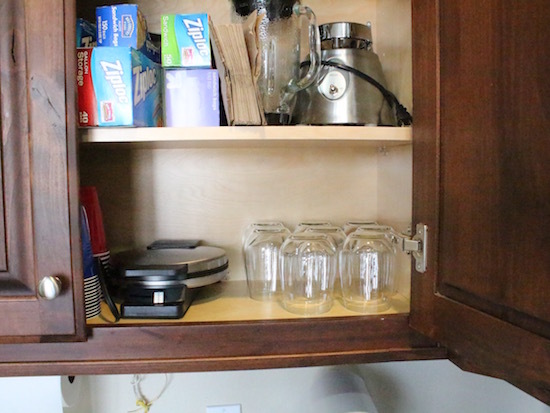 I wanted to use more vertical storage to create more cabinet space next to them. My solution to both problems? 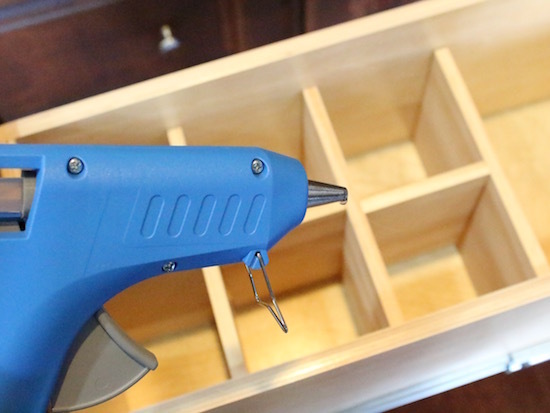 Make my own drawer dividers and shelves! Cool right? Here’s how I made them. It was so easy. 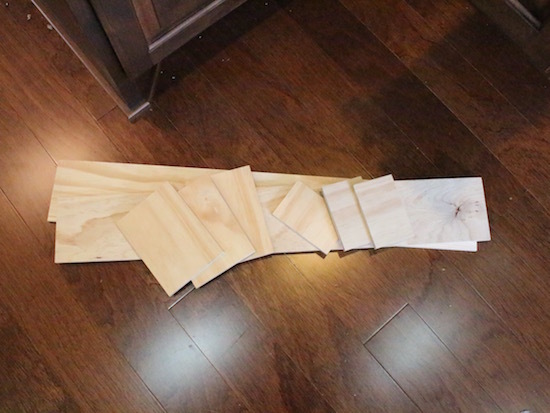 I headed to the hardware store and purchased some pre-cut wood strips. They are 4″ wide and I think they came in 4′ lengths. 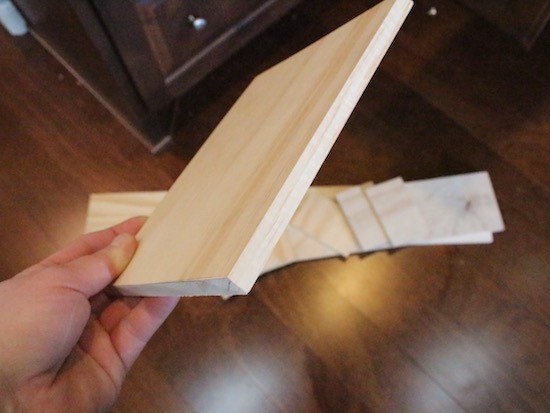 After some quick measuring and math, I cut the wood to the lengths I wanted. 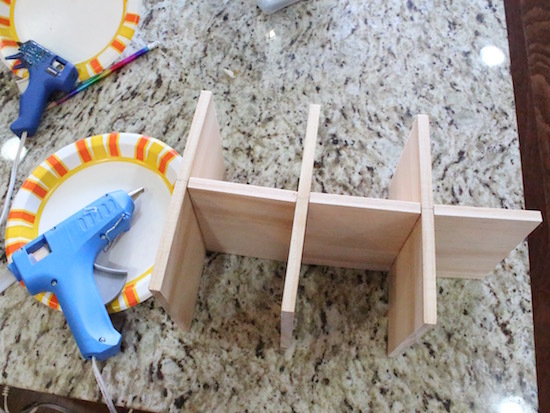 Using a hot glue gun (yes, a hot glue gun! ), I glued all the pieces together. 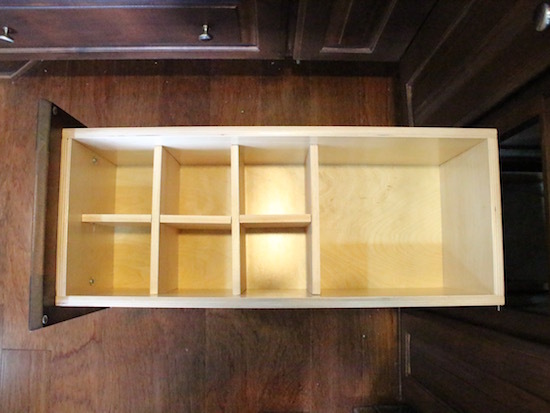 I glued them outside the drawer and then inserted the entire piece into the drawer once assembled and dry. 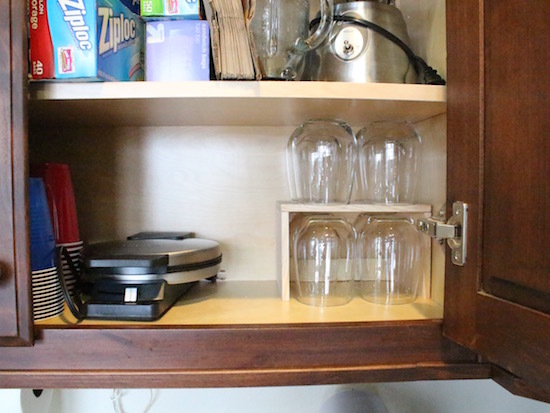 For the wine glass shelf I built it the same exact way… I just assembled it with hot glue while on the counter and then set it into the cabinet. Seriously, these were so easy to make. 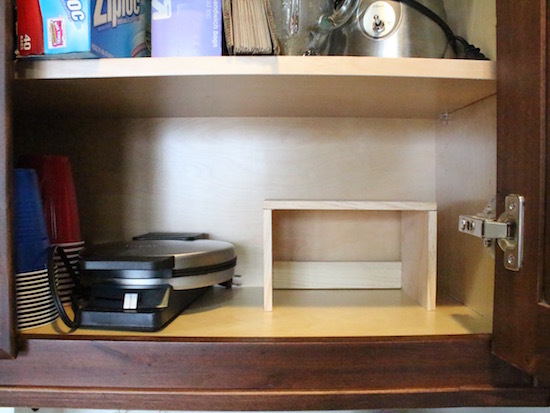 After we moved to Colorado I brought the wine shelf with me, but the other drawer divider was custom to the drawer so it got left behind. If you end up making one, I’d love to see it! Oh my…how I have needed to see this! 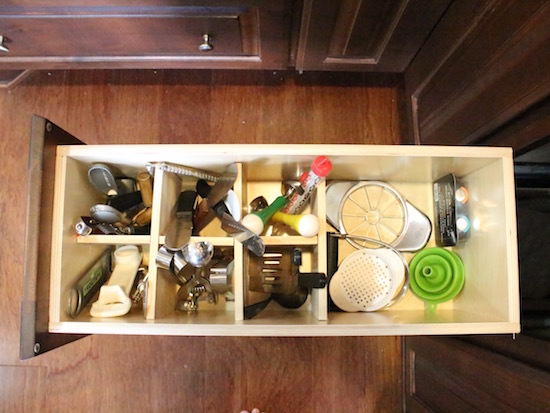 The drawers in my bathroom and kitchen are odd sizes but they really need organizing. I will certainly be doing this! 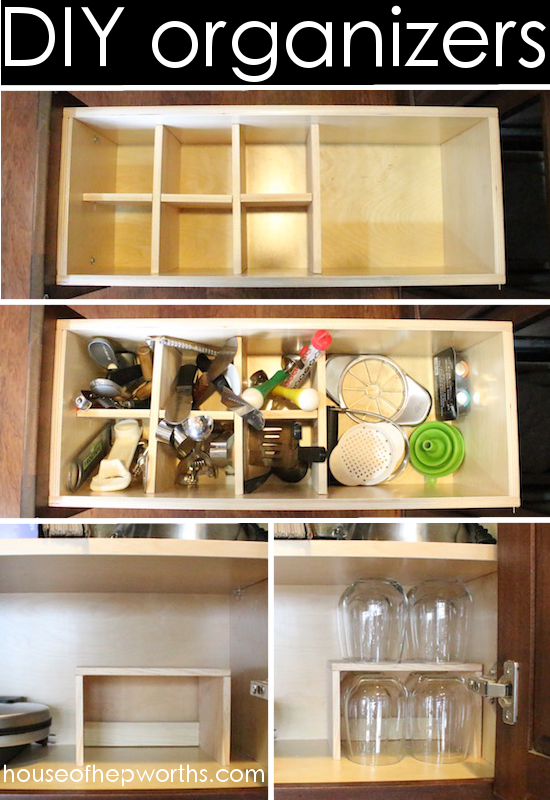 I really need to do this for a few dresser drawers.